Riding a bicycle is a fun, healthy, and great way to be independent, but it is important to remember that a bicycle is not a toy; it’s a vehicle! 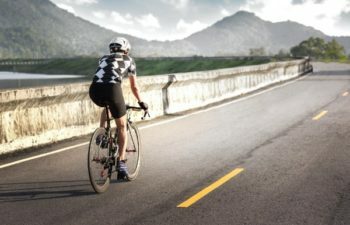 In fact, the statistical report on unintentional injuries created by the National Safety Council reported that 488,123 people were treated in emergency rooms in 2015 after being injured riding a bicycle. The only sport resulting in more injuries overall was basketball, at 493,011. Football was third, at 399,873. These safety tips will help ensure a fun and safe bike ride. Wear a Helmet, Make Sure it Fits. Make sure to take steps to ensure your helmet fits properly before every ride. For more information check out this infographic by the National Highway Traffic Safety Administration. Maintain the bikes. It is essential to keep bike chains clean and well lubricated. Be sure to periodically inspect your bikes brakes and tire pressure as well. Avoid Night Riding and Busy Roads. Your chances of being in an accident go up significantly at night with lower visibility. In the same respect, busy roads and high traffic areas represent challenges do to the amount of vehicle movements bike riders must account for. See and Be Seen. Before riding at night or in low visibility situation ask someone to help you check your visibility to motorists. WEARING WHITE HAS NOT BEEN SHOWN TO MAKE YOU MORE VISIBLE. Wearing neon, fluorescent, bright colors, and reflectors is advised. In addition, make sure your own flashing lights and/or headlights are in proper working condition so you can maintain visibility yourself. Right is Right. Always ride on the right side of the road, never against traffic. Communicate your intention to turn, stop, or change lanes using recognizable hand signals. In addition, before and after utilizing hand signals check for other vehicles in both directions. No Distractions. Do not wear headphones while riding so you can keep your ears open for horns, vehicles, or voice commands from other people in the area. Keep both hands on the handlebars at all times, with the only exception being when you are signaling. Utilize the Sidewalk. Children under 10 or who are not mature enough to operate a vehicle in the street are better off riding on the sidewalk. In Florida, bike riders have the same rights to the sidewalk and crosswalks as pedestrians. Still watch for vehicles, especially around driveways, and pedestrians. Additionally, enter a street and make turns at corners and not between parked cars in order to increase a vehicle’s ability to see you. Remember, Injured? Call Me On My cell at 813-254-7119 or go to www.CallMeOnMyCell.com to receive legal assistance!